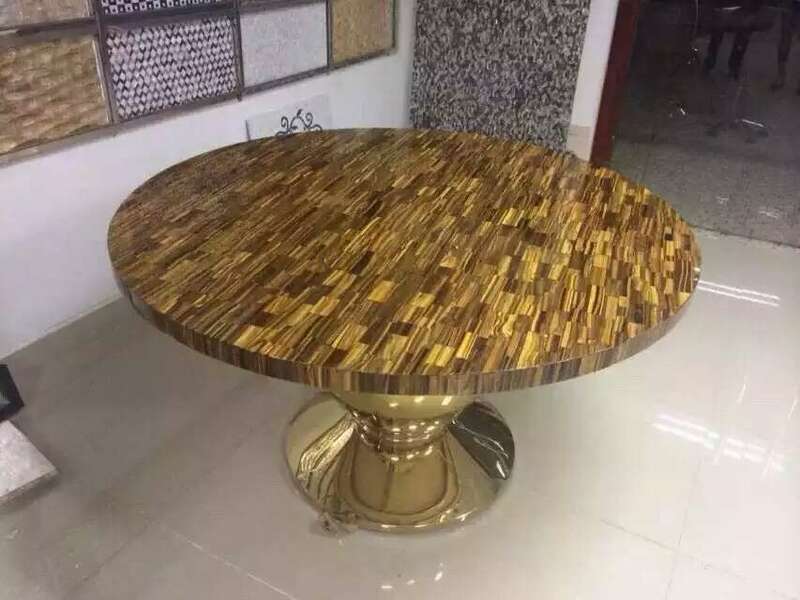 Semi Precious Stones, tiger eye stone table tops series -- Yellow Tiger Eye stone table top- ,this model of round table top can have real wood and metal stand as you like, you can take it as side table ,Flower Pot Stand, coffee table. surface finish is polished, table top shape can be round or rectangle,thickness is 2cm (normally 0.5cm Blue Sodalite +1.5cm natural commercial stone or artificial stone/glass/Acrylic); of course size can be custom. 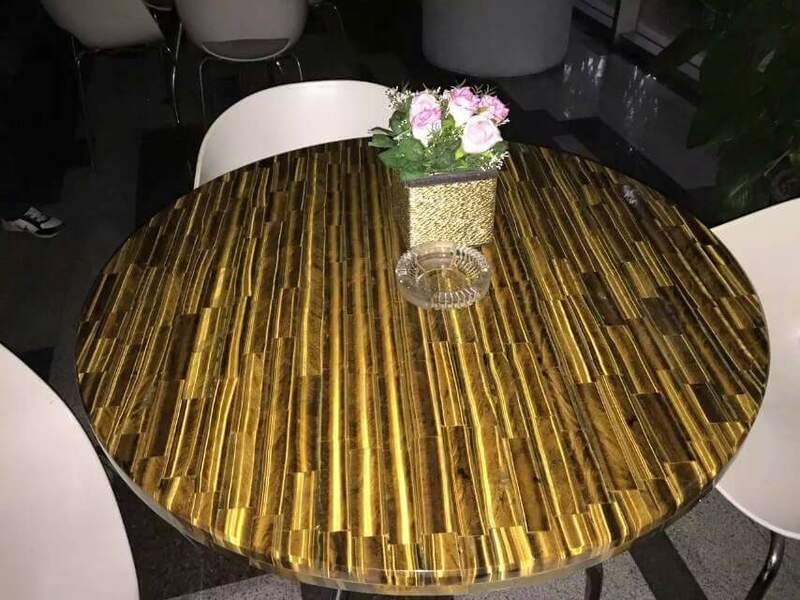 For Semi Precious Stone Table Top, we offer wide range of Semi Precious Stone, such as tiger eye(yellow ,yellow and blue color),blue sodalite, agate(various color for your reference). For table top stand, we can produce with real wood, metal. 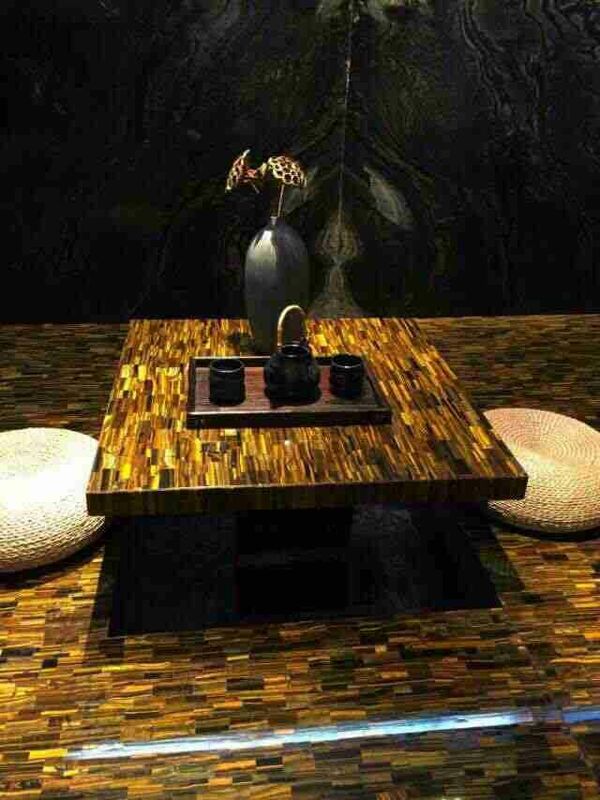 Tiger eye is very suitable to be produced on translucent or non translucent slab,side table, coffee table, dinning table and countertops. our annual yield of tiger eye blocks is about 100containers. According to the color purity and texture, the blocks have different ranks for your reference. For tiger eye stone price and product details, please consult with HR STONE . We ship the blocks to China and produce them into finished products, such as Tiger Eye slabs, countertops, table and arts. Material: Yellow Tiger Eye; blue sodalite and agate also can be for your choice. Color: yellow; other Tiger Eye`s color for your choice such as yellow and blue, blue color. What is Tiger Eye stone? Looking for ideal Tiger Eye Manufacturer & supplier ? We have a wide selection at great prices to help you get creative. All the Tiger Eye Stone are quality guaranteed. We are China Origin Factory of Semi Precious Stones. If you have any question, please feel free to contact us.